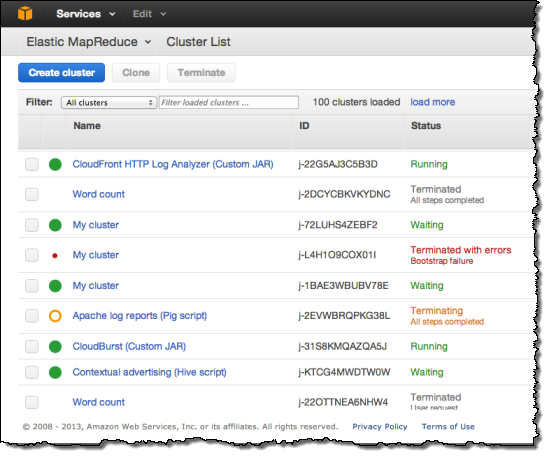 Amazon Web Services (AWS) has updated its Elastic MapReduce console, making it easier to manage large amounts of data. The update centers on providing better usability and access to new features that include resizing a cluster by adding or removing instances; cloning a cluster; running Hadoop 2; and targeting a specific availability zone. AWS is notorious for its complexity and usability. The model is to provide the bare minimum and let the user add AWS or third-party services for their deployments. But with the acceptance of cloud computing from the overall market, there comes a higher bar for the way a service is presented. AWS executives made a point last year at AWS re:Invent of stressing their commitment to the enterprise market. That’s a challenge for AWS as competing providers like Google offer managed services that abstract the complexity that comes with using cloud services.